Can you believe that these are edible seashells? So pretty right?!? They are made from cooked sugar, just like a lollipop. 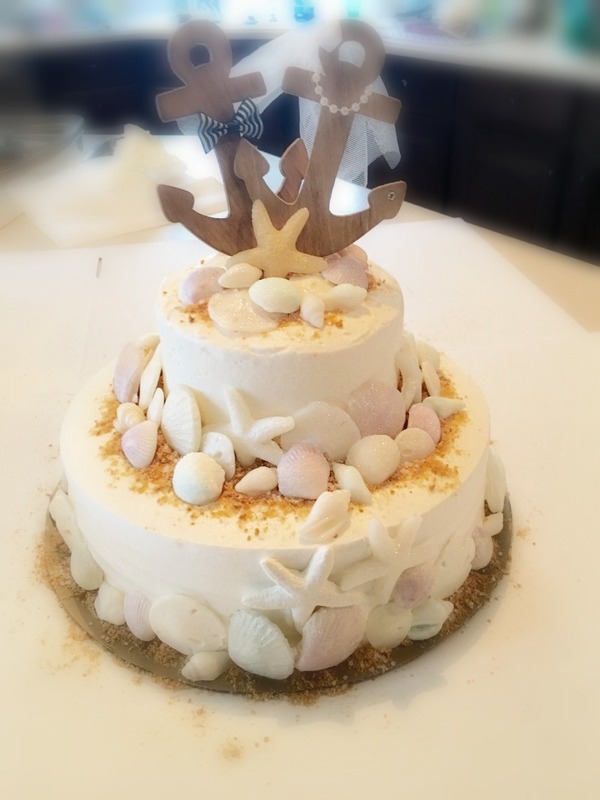 I came up with the idea when I was asked to help decorate a beach themed wedding cake. The wedding was in another state and it was for a family that I have known for years. My best friend’s sister that I have known since she was 18 was now getting married! Did I mention it was in another state? As much as I LOVE a challenge disappointing someone on their wedding day was NOT an option! Did I mention how honored I was that she asked me? I had to come up with a foolproof idea that was sure to turn out great. With the help of Pinterest, the bride was able to send me pins with ideas. Since I was traveling out of state the cake portion would be a prepared blank slate for me to decorate and the cake toppers were already purchased. I needed edible seashells and sand that would look realistic, hold their shape through transporting (in August heat) and the day of the wedding. If I used white chocolate in candy molds, they would have melted. Fondant doesn’t always hold it’s shape well and gum paste is too hard to actually eat. I thought that a shell in candy form could hold it s shape well and not be affected by temperature changes and would hold up well to exposed air. For my idea of edible sugar seashells I knew I needed silicone molds. Silicone can withstand the high temperatures of cooked sugar. I searched for silicone seashell molds everywhere without much luck until…. I looked on Amazon. They had molds I didn’t think I was going to be able to find at a good price and sent them FAST! For the sand I simple grated a combination of ginger snaps, vanilla wafers, graham crackers and sprinkled with sanding sugar. I kept the finished cookie “beach sand” in a airtight container to keep them fresh until needed. I made a LOT of shells! 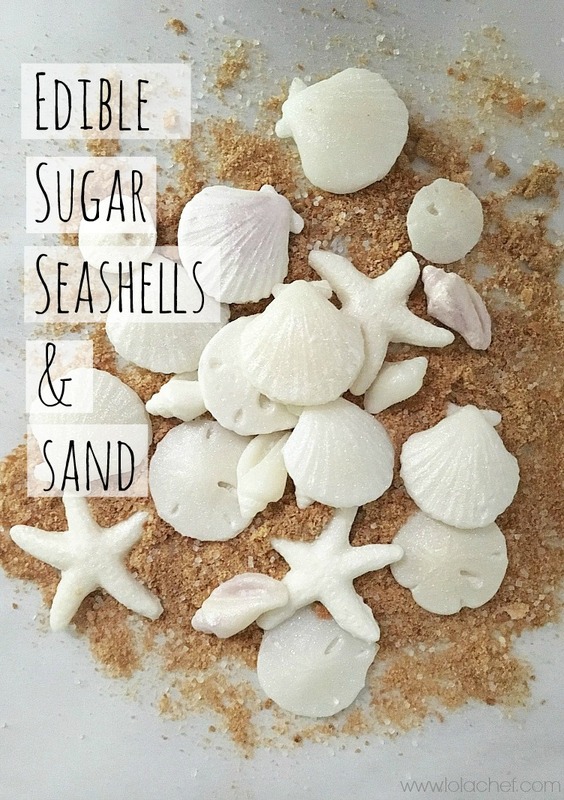 These are mini candy recipe in seashell shapes for a summer dessert decorations or toppings. In a medium saucepan with a candy thermometer attached to the side, (not touching bottom) add sugar, water, and corn syrup to the pan and stir. Turn stovetop to medium heat and bring mixture to a slight simmer. Carefully watch temperature as it cooks. Bring mixture to 200 degrees, then slightly raise temperate to medium-medium high heat (slightly above medium). Carefully monitor temperature, bring mixture up to 300 degrees. Once it hits 300 degrees, which may take 15-20 minutes remove from heat and immediately add food coloring. Stir food coloring carefully, it will be very hot. Immediately pour into molds. I use oven mitts to handle and pour into small heatproof silicone cups to hep pour into molds without making too much of a mess. Once poured into molds I place in freezer for about 15 minutes to cool and set. Brush the shells with confectioners sugar once cooled to prevent sticking. I found that if you prepare properly with some useful tips this whole process can be easy. First have all molds cleaned, dried and ready. I lined a large baking sheet with parchment paper and placed all molds on top of lined baking sheet before starting. Also, spraying measuring cup and spatula with cooking spray before pouring corn syrup helps prevent sticking. Once sugar is cooked to 300 degrees remove from heat and add food coloring. 300 degrees is the hard crack stage. You need to let temperature reach 300 degrees or the finished candy may be too sticky and stick to your teeth. I poured sugar into a silicone cup that made it easier to carefully pour into the small molds without a lot of spillage. I used a silicone cup similar to OXO Good Grips 2-Cup Squeeze & Pour Silicone Measuring Cup with Stay-Cool Pattern I did not add flavoring because I needed them to stay white. They tasted good without any added flavors. Once poured, I immediately placed baking pan in freezer to set the molds. After about 10-15 minutes check molds, they should be solid and not move if you tap them. Remove from freezer when done and gently remove from mold. They will come out easy. Place on a clean sheet of parchment paper and brush with confectioners sugar with a pastry brush. Brush sugar on and cover completely and brush excess off. This will prevent them from being sticky. Once they were all complete I brushed them with edible luster dust such as Wilton 703-212 Elegant Shimmer Dust Food Decorative in white for added sparkle. This sparkle dust also comes in colors. On a few of the shells I added a small amount of lavender and aqua edible dust mixed with confectioners sugar to lighten and brushed on after the white layer for a subtle effect. I even made a gold starfish to represent my bestie! She made it to the top of the cake! These shells are also the perfect size to top a cupcake sprinkled with sand. *this post contains affiliate links to helpful products. These are absolutely stunning! Great idea!